Operational Excellence continues to gain popularity. A recent worldwide survey by the Business Transformation & Operational Excellence World Summit found that over half of respondents believe OE is on the rise, and nearly half have an Enterprise-wide Operational Excellence (OE) program in place. Yet, despite the popularity, several studies have found that between 50% and 70% of “OE Programs” fail to deliver their expected results. For most organizations, achieving Operational Excellence will require transformational rather than discreet changes. It may require transforming the way we think about Operational Excellence, transforming what we work on to achieve it, and transforming the environment to make those efforts successful. 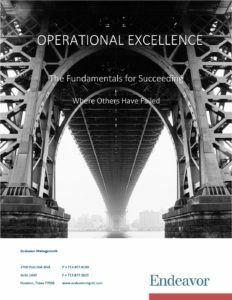 In this white paper learn the fundamentals for transforming your organization through Operational Excellence. Fill out the form to download.